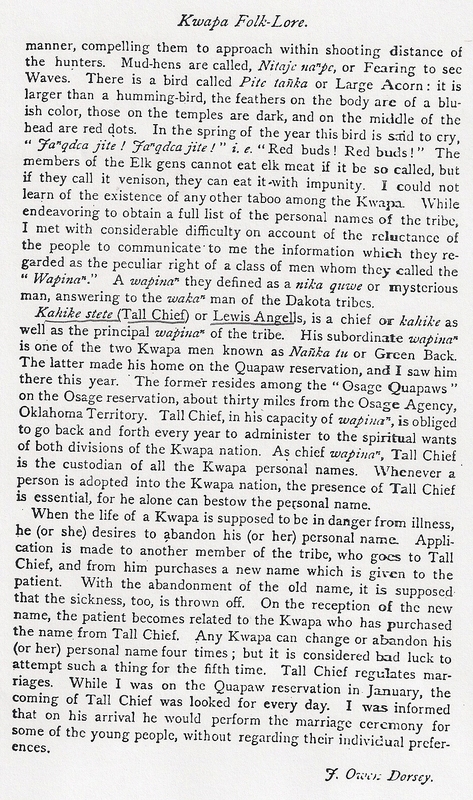 Tall Chief or Louis Angel was born at Hucha pa tah wha (Quapaw town) between Cherry Creek and Labette Creek on the Neosho River in what is present day Kansas around 1840. Most all of the Quapaw tribe lived in this area at that time. The rest of the tribe lived on the Canadian and Red Rivers. His father was the hereditary Chief, Kah hi kah te dah or Lame Chief and his mother was Mi ska na zhe. He was named Wa zhi hunka which was later translated in English to Sacred Angel Bird ( or the eagle that led the people from the four upper worlds to the earth). The Wa zhi ni (white people) also called him Tall Chief because he was so tall (translates to Kah hi kah ste tah in Quapaw). In his later years, he always wore a huge western hat with a big eagle feather which made him look even taller. 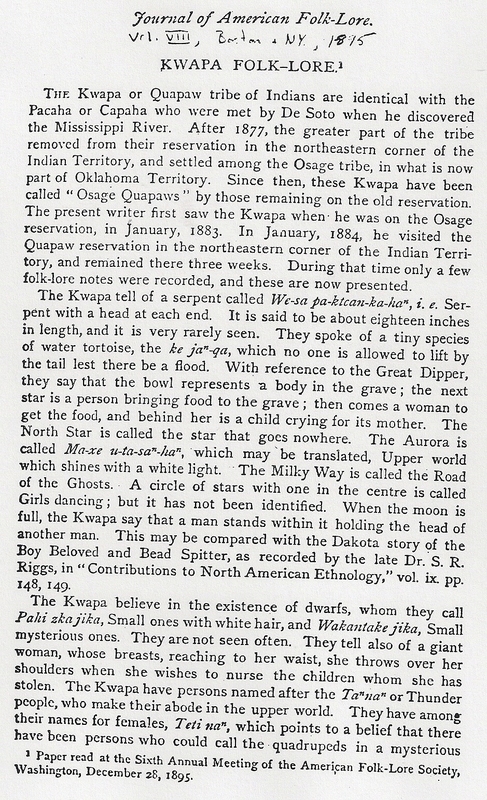 In 1870, the Quapaws moved to Quapaw Creek near present day Skiatook, Ok. They lived there until the late 1880’s, when the Government directed them back to Quapaw to claim their allotments. Tall Chief Creek and Tall Chief Cove near Skiatook were named after Tall Chief. On July 1, 1873, after the resignation of Alpensus Valier as blacksmith for the tribe, Tall Chief was appointed as the blacksmith at a salary of $240 per annum. Tall Chief actually never worked as a blacksmith as he hired another person to perform the duties. 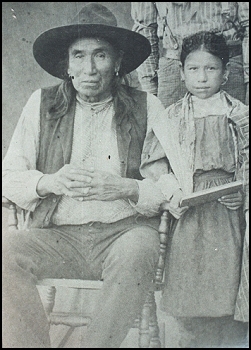 Tall Chief became Chief after his father died in 1874. He was well known and greatly admired and recognized as a fair and just chief. He had an outstanding memory and could remember the names and relationships of practically all the members of the Quapaw tribe existing within the last hundred years. His testimony was much sought after in territorial days, after the allotments had been made, for the purpose of determining the heirs of deceased allottees. 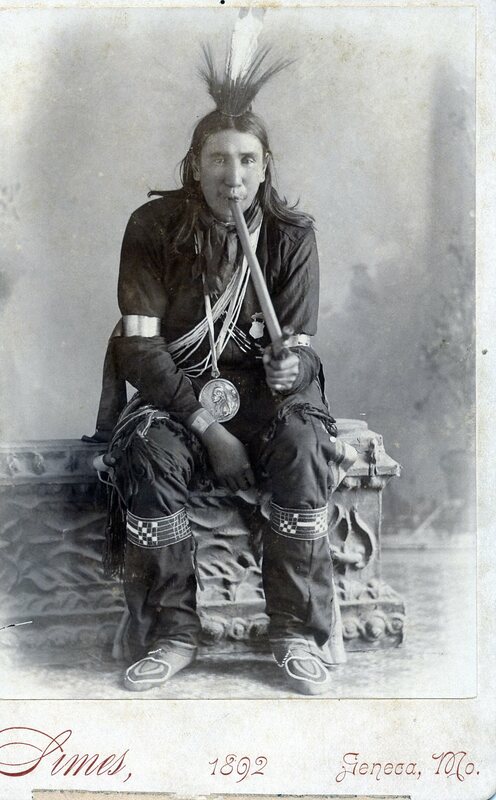 He was married many times (1), had many children, but only his daughter, Mary Maude Angel-Tallchief survived. He only spoke Quapaw. He could recite his ancestors’ names (hereditary chiefs) 12 generations back. John “Moonhead” Wilson, Caddo-Delaware, first brought the peoyte religion to this part of the country. In 1898, Kah hi kah steh tah heard about it and asked him to bring to Quapaw Creek. Tall Chief invited the Osages (Claremore, Black Dog, John Logan, Francis Claremore, etc.) to come to the first meeting at Quapaw Creek. They then built their own meeting houses. He and “Moonhead” then took it to the Quapaws in Northeast Oklahoma. Kah hi kah steh tah had a church at Quapaw Creek and also one near Spring River at Quapaw (West Moon). Tall Chief died August 26, 1918 and is buried on his allotment near Spring River. Wa sis ta (Mary Maude Supernaw’s mother), Hatti Crow ( a niece), Peter Thompson and Victoria Thompson (Willie Thompson and Mary Maude Tall Chief Thompson’s children) are buried with him. (1) Sha we ni teqi (Difficult Female Beaver); Mi zhi te (Red Sun); Wa si sta (no translation); Mi tsi no (Mary Mudd); Emma Squirrel White (she was Cherokee) . Photo of Tall Chief "Simes, 1895 Seneca, MO." 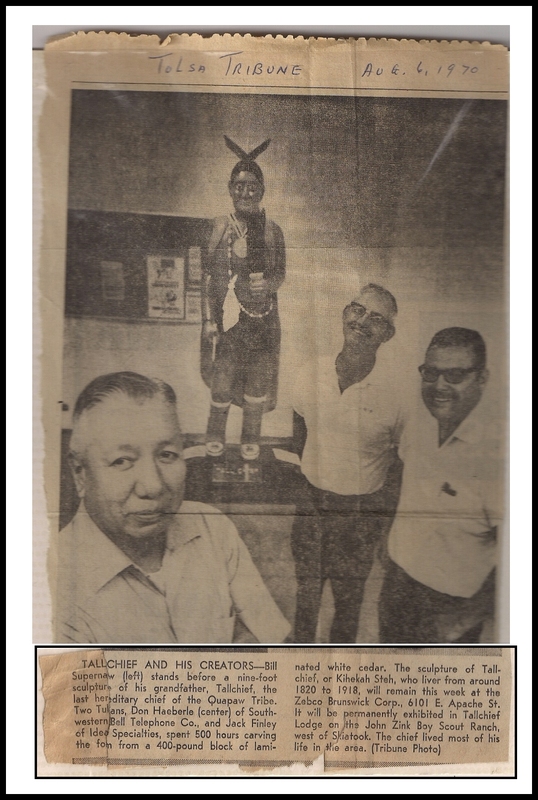 Tulsa Tribune Photo and Article from August 6th 1970 of the Tall Chief sculpture that is now located in Tall Chief Lodge at the John Zink Ranch- Camp Tall Chief. 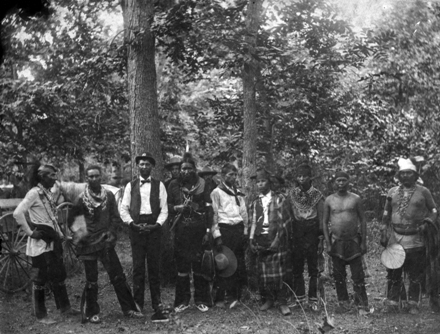 Tall Chief is the one with the tommyhawk, next to his left is Charley Blaylock (possibly) and then Robert Thompson is to Blaylock's left and is in a blanket. Taken around 1890-1895 between Sperry and Skiatook.